Tag Archives for " Josh Kaufman "
Okay, I fully expect that title to tick off a few folks holding real MBA degrees and that’s cool. 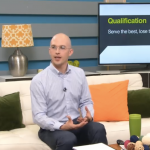 No you won’t actually get anything close to an MBA degree from listening to this podcast, but you will get some great information and won’t have to take out a $150,000 loan. You can argue the merits of both book and case study learning and in the street, smack you if the face learning done by most small business owners. My guest for this episode of the Duct Tape Marketing podcast is entrepreneur and prolific business book reader Josh Kaufman. 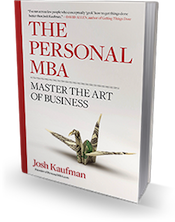 In an effort to grow his own business, Josh spent five years or so (and continues) reading every business book he could get his hands and compiled that knowledge into a book calls the Personal MBA: Master the Art of Business. One of my favorite things about this book is that I believe he condenses and great deal of knowledge into a small business but also focuses on what’s really important to entrepreneurs. The chapter on value creation if worth the price of the book by itself. There are useful chapters on finance, marketing and management as well as a great deal of information on systems and systems thinking – something missing from most small businesses. I also like the fact that he slips some information in that might only be found in self help types of books – believe me, this information is so important to the entrepreneur, but gets little mention in most academic environments. I get to speak to a number of MBA classes these days and while they seem to be getting a first class education in the fundamentals of business, few things can make up for the layers of information that come from real world trial and error.